Earlier this year, I was one of two Louisiana poets who read at a Valentine’s Day poetry reading on the stage of Casa Azul in Grand Coteau, Louisiana. Although Patrice Melnick, owner of Casa Azul and coordinator of the program, didn’t mandate that we read love poems, I prefaced my reading with an explication of the four categories of love C.S. Lewis wrote about. I explained that Lewis, the great Anglican apologist, didn’t discover Eros until he married late in life and that he wondered why he’d been hanging out with all those grumpy guys in the Inklings group so many years instead of romancing someone like his wife Joy. The four categories Lewis wrote about are storge, or affection, which Lewis said was a ready-made love in families, the result of fondness due to familiarity; Philio, or the love defining friendship; Eros, or the love that Lewis says can become a god to people who fully submit to it; and finally, Agape, the love that engenders caring–charitable love, a type of sacrificial love. The work of Pierre de Ronsard, French poet of poets, has been described as “an easy mix of scholarship and love of natural beauty,” a phrase I think aptly captures the essence of Intimacies & Other Devices. Gary Entsminger, editor and publisher of Pinyon Publishing, reports that Heinzelman ranks in the top 60 in Amazon’s “Love Poems” category. His work stands alongside Pablo Neruda, Rumi, Shakespeare, Blake, and other notables. This is a collection of poetry executed in its many forms and feelings by a master poet, a book in which the author isn’t afraid to raise the shades on the window into intimacy. Additionally, the photograph on the cover of Intimacies, derived from the painting, A Young Woman Reading by Lucius Rossi, is a real eye catcher. Heinzelman is editor-at-large for Bat City Review, editor-in-chief of Texas Studies in Literature and Language, and a member of the Texas Institute of Letters. Order from Pinyon Publishing, 23847 V66 Trail, Montrose, Colorado 81403. I knew I was in for visual excitement and good reading when I opened the fourth volume of Pinyon Review. On the title page of this journal celebrating the Arts and Sciences, a bewhiskered bobcat stared at me, his grey-green eyes watchful for prey. It was a photograph taken by Susan Elliott, artist, illustrator, and managing editor of the Review, who seems to be as accomplished at photographing wildlife as she is at drawing and painting it. From e-mails exchanged with Gary Entsminger, publisher and editor of the Pinyon Review, I knew that the bobcat had wandered near the cabin that houses the independent press he and Susan operate on the Uncompahgre Plateau near Montrose, Colorado. I’m expecting to see a piece of original music composed by Susan appear in the Review any day now since Susan is also an accomplished musician, composer…scientist, gardener, chef…the list of her talents is long! 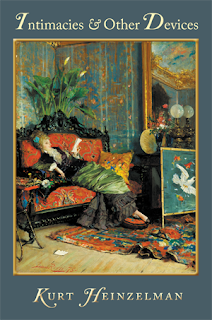 A long short story in this issue of the Pinyon Review is certain to attract and hold the interest of writers. It’s a cogent lesson for writers about the friendship of a wannabe writer and a seasoned writer/teacher. The wisdom and eloquence of William Blake, e. e. cummings, and Tennyson is included in this gut-wrenching spin about life in the shadow of death. The fulfillment of a teacher’s desire to return to his second home in mountain wilderness and a student’s realization of his purpose in the world combine in a poignant story by Neil Harrison who derived his title “Cold Earth Wanderer” from a passage in one of Blake’s poems: “I traveled through a land of men/A land of men and women too/And heard and saw such dreadful things/As cold Earth wanderers never knew.” Harrison wove many passages about writing into the story without being didactic, and a paragraph toward the end of the story captures the mystique of the writing process better than any manuals on the craft I’ve read: “…There he’d learned the alchemical magic of words, that rare, inexplicable phenomenon whereby the basest of materials, a broken stick, a piece of charcoal, a pencil or pen, could conjure up spiritual gold, imbuing the wielder with a sense of belonging, of oneness with the vast universe in its ever-ongoing creation. At the front of that classroom his teacher and soon-to-be friend, Alan Horn had voiced the precise words Everett needed to hear at the time, perhaps not even fully aware that he was offering the keys to a kingdom…” Wow! 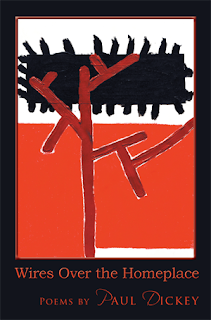 Twenty-four poems showcase the work of poets ranging from haiku by Jay Friedenburg to a prose piece about writing by Jane Hilberry. Friedenberg also treats the reader to his impressionistic pastels of landscapes; e.g., “Blue Mesa,” a soft pastel of an Arizona scene. Editor and publisher Gary Entsminger treats us to one of his poems entitled “Masks,” in which he describes a dim view seen at night when he pulls the curtain back and looks out at “the porch cav[ing] into ruined couch/below unshingled casts from lamplight,” a view which is transformed as he ascends “well rested stairs toward bed/as if heaven waits.” Gary, who has written and published many of his poems throughout the years, makes his debut in Pinyon Review with this single poem from his collections. Stan Honda, who photographs night sky landscapes and is a photographer for Agence France-Presse based in New York City, contributed the cover photograph and a special section of Wupatki Sky photographs for the Review. 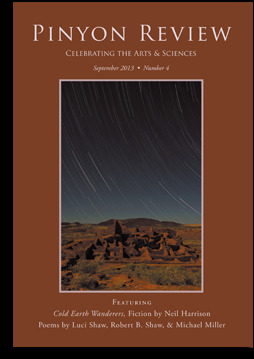 Entsminger aptly describes Pinyon Review as one that contains “contrasting colors and images that highlight place and mood during the transition from summer to fall,” and he and Susan certainly achieved that effect when they put together this exciting issue. Impressive! Order copies from Pinyon Publishing, 23847 V66 Trail, Montrose, Colorado 81403. A few days ago, I attended morning services at St. Mary’s Chapel as I usually do on Tuesdays. It was a day overhung with thick fog, and I confess that my mind was as befogged as the outdoors when the lector began reading the Old Testament lesson. I was jolted awake by the names Cyrus and Darius, two Achaemenid kings who reigned over Persia during the fifth and sixth centuries BCE. 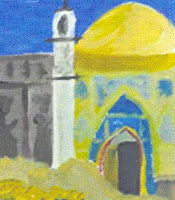 I lived in Iran (contemporary name for Persia) during the 70’s and read a lot of history about the Persian Empire when it was at its apex during the two kings’ reigns, so the names caused me to pay more attention to the reading about Cyrus freeing the Jews from Babylon captivity and supporting the beginning of the rebuilding of the Jerusalem temple. I remembered that Darius, who followed Cyrus, continued generous funding for the reconstruction of this temple. This great Persian king ruled over forty different ethnic tribes in a domain that stretched from India into the Balkans, and his empire covered three million square miles. The day following my reminiscences about Darius, I picked up the newspaper and read that the new president of Iran, Hasan Rouhani, has informed the UN General Assembly that he seeks to work with the international community, and Iran stands ready for “constructive engagement.” He has also freed political prisoners, replaced the military with the foreign ministry to lead nuclear negotiations, even acknowledged Jews worldwide by wishing them well on Rosh Hashanah. To me and many Americans, his words sound encouraging. Having lived in Iran for two years, I have some sympathy for the people and the future of this country. My “what if” thoughts about Rouhani border on wild and crazy miracles when I express that I wish he’d take a leaf from history and would really return to the views of the ancient Achaemenian kings, Cyrus and Darius, who practiced tolerance for and generosity toward the faiths and religions of other countries. 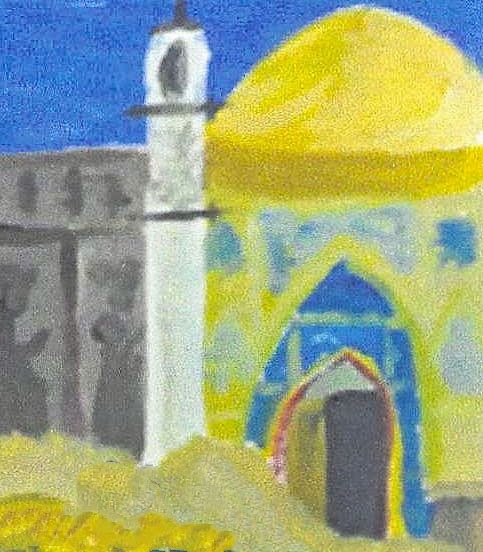 The above picture is a segment of a painting done by Paul Schexnayder of New Iberia, Louisiana for the cover of my book, Sophie’s Sojourn in Persia. It's nice to open the windows at night and let in the fresh air of the southern Appalachians. Although we refer to a sojourn in Asheville as a "Busman's Holiday" because we have the same type terrain on "The Mountain," Asheville does provide a dose of city life we don't get in our village of Sewanee, Tennessee. 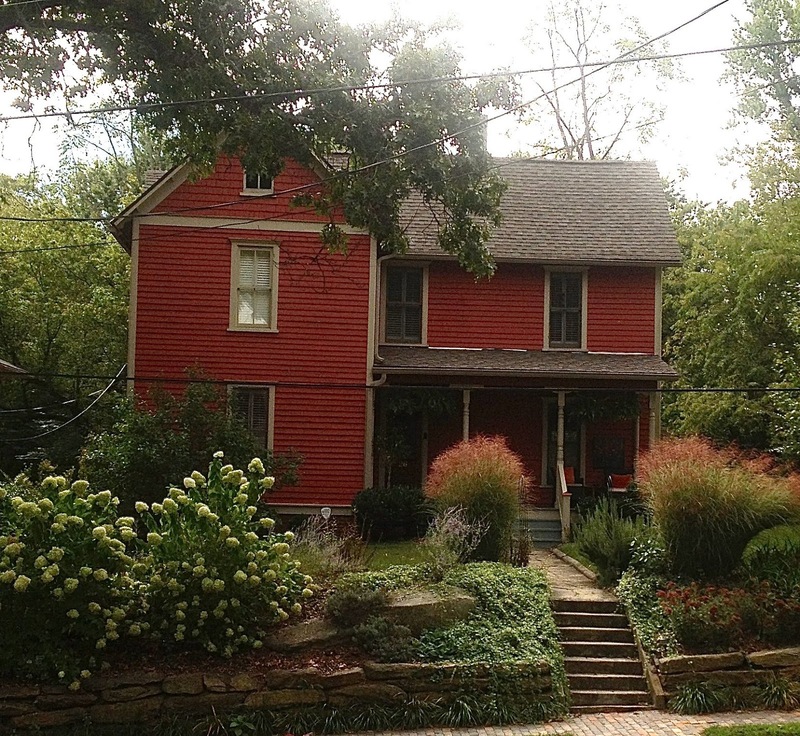 We're staying in a renovated Queen Anne style home in Montford, the National Historic District of Asheville. 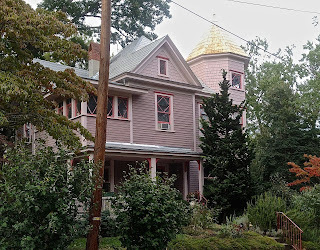 The neighborhood is a homogenous area touted as having 600 structures that reflect a diversity of architectural styles that were built between 1890 and 1920 when Asheville began to burgeon as an important city in North Carolina. Due to the vision of a lumber magnate named George Willis Pack, residences began to spring up in an area designated as Montford near the turn of the 20th century. Some of the residences became boarding houses similar to those immortalized in Thomas Wolfe's Look Homeward Angel, but most of the imposing structures were the homes of businessmen, attorneys, doctors, and architects who represented the upper middle class of Asheville. Although the architectural style of the homes in the neighborhood is described as Victorian, the prevailing style at the turn of the century was Queen Anne, a style with which I'm familiar because as a child I spent summers in my Grandmother Nell's Queen Anne style home in Franklinton, Louisiana. 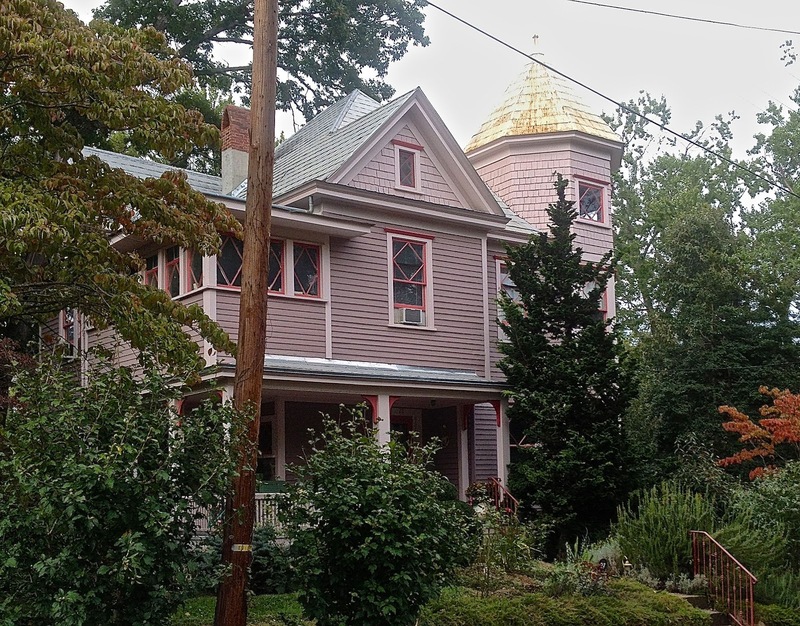 It's a style that has corner turrets and towers and irregular rooflines—Grandmother Nell's home reflected that description, and her roof boasted a cupola with a stained glass window. We're enjoying a room in the home of Carolyn Spain who once ran a boarding facility and now rents out one room for tourists, a lovely room with woodwork painted a soft shade of mauve and high ceilings, filled with antique oak furniture and an authentic clawfoot tub in the bath. From one side of the room, we can look out at a series of interlocking gardens filled with sunflowers, roses, azaleas, morning glory vines, Echinacea and a gracious plenty of dogwood trees. Carolyn, our hostess, pointed out a small pond that a few days ago held prize coy fish before a blue heron flew in and devoured them. Carolyn's home is the Bosse Bryan House, circa 1897, a Queen Anne style residence, built by J. H. Bosse who migrated to the U.S. from Germany in 1866. He owned and operated a grocery on Haywood Street and constructed this residence 31 years after coming to Asheville. Later, the Bryan family occupied the house from 1920-1970, and Carolyn bought it during the 1980's when she began massive renovation work. The house's architectural style is described as having "notable features that include irregular massing, a prominent polygonal tower clad in shingles at the upper level, and a recessed porch with Montford brackets." This residence is located not far from the famous sanatorium founded by Dr. Robert Carroll who treated Zelda Fitzgerald, wife of F. Scott Fitzgerald, for a psychiatric disorder. Zelda was among nine women who perished in the 1948 fire that caused the main building of the hospital to burn to the ground. The artistic influences of notables like Bruce Price and Frank Lloyd Wright can be seen in several houses in the Montford neighborhood. The homes reflect the upscale segment of society that existed in Asheville at the turn of the century and for several decades thereafter. We sat on the side porch that is the private entrance to the room in the Bosse Bryan House and enjoyed drinks with Carolyn and her friend, Berry Bate, who does ornamental ironwork and sculptures, one of which is featured in Carolyn's garden—a giant replica of dogwood flowers rendered in copper and iron. Berry has created a plethora of artistic pieces for historic places in Asheville, including the pedestrian entry gate to the Biltmore Mansion and a rhododendron wall piece for the Grove Park Inn. She has done metalwork for over 2,000 residences, and for cities, universities and corporations. Berry says she's inspired by forms found in nature and that her mind whirls with new ideas for artwork. 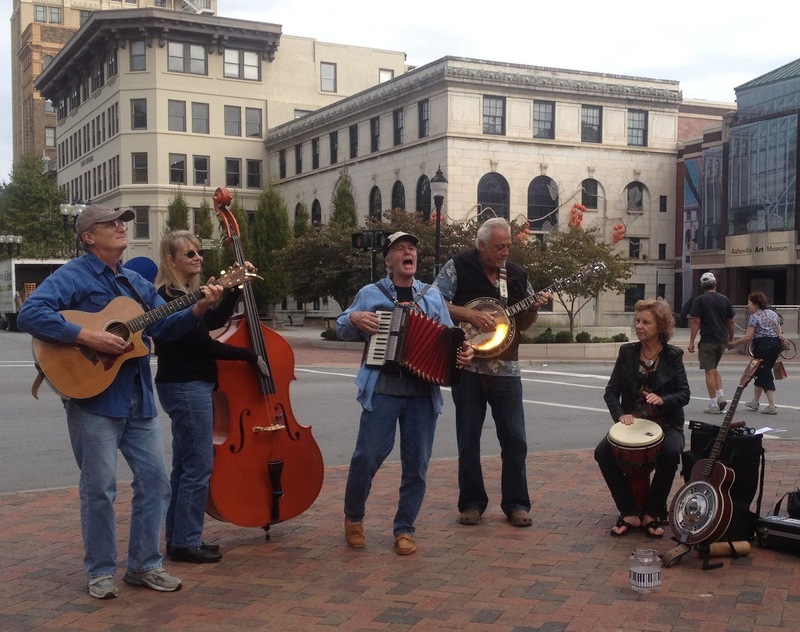 Her studios are located in Asheville and Lake Toxaway, North Carolina. Adjacent to the Montford residential section is the Riverside Cemetery, known for its natural landscaping and for the gravesites of two of my favorite authors, Thomas Wolfe and O'Henry. Thomas Wolfe used the cemetery as the background for a moving scene in Look Homeward Angel shortly after Ben Gant (Wolfe's brother) dies—a place that Wolfe has a character describe as one in which "…you can get a nice view of the town…"
If the arresting title of Pinyon Publishing’s latest poetry publication, Wires Over the Homeplace by Paul Dickey, doesn’t attract readers, the sharp black and red cover painting entitled “Bold Painting” by Ira Haber will certainly entice poetry lovers to look within. However, readers don’t have to read far for their interest to be captured by poems of energy and variety that introduce a poet who writes at the center of things. Paul Dickey crosses the boundaries of space and time in the opening section of Wires Over the Homeplace, entitled “Frontier Ancestors,” in the poem by that name, “bearing the full baggage of history, stowing the ancient instruments/that no more predict the future” and moving on to “where the rivers part…” in a late 18th century Pennsylvania frontier, then across the U.S. into the postmodern era. He transports readers into harsh places of the Midwest--at a public auction of the revered family farm and to a scene where “plump and skinny wives crow of granddaughters with money and day jobs in Milwaukee…” reaching out to every generation with his wry style conceived in democratic introspection. My favorite section, entitled “A Knack to Losing Things,” shows Dickey’s ability to execute a bit of partner poetry in which he dialogues with the deceased American poet Elizabeth Bishop, author of “One Art.” He links himself with Bishop’s lines about significant personal losses with his own lines “What had been lost along the casual way/will not come back to me another day,/and to be frank, it often will not do/to keep a useful thing its use past due…” This “union in identity” carried out by many poets has been explicated in David Lehmann’s preface to The Best of American Poetry, 25th Edition, in which Lehmann explains how poets often “take note of an ancestor, ally, or rival” and begin a dialogue with a deceased poet about a mutually-inspired subject. In the section “We Never Know,” Dickey confronts aging, writing poems that are so poignant they cannot be dismissed by those who have reached the evening of their lives; e.g., “A Retiree Ponders His Day,” in which Dickey ponders his “morning of many rooms” and likens his life to a phonograph needle, listening to the “scratches, hisses, the pops that even now sound like the many years of himself…” These metaphors are woven into poems of sustained power throughout the section and affirm Dickey’s poetic strength in illuminating ordinary objects and people so that readers easily connect with his vision. Dickey belongs among the Best of American Poets, and Wires Over the Homeplace is a significant work of contemporary poetry – each poem in the volume is a polished gem. He adds another star to Pinyon’s galaxy of outstanding American poets. 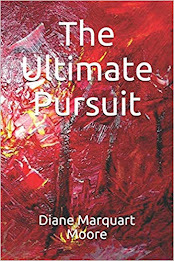 Dickey is a poetry and philosophy instructor in Omaha, Nebraska and has published poetry book reviews, poetry, fiction, plays, and creative non-fiction in over 100 journals. His recent books include They Say This is How Death Came Into the World and Liberal Limericks of 2012, a collection of humorous political poems. Order Wires Over the Homeplace from Pinyon Publishing, 23847 V66 Trail, Montrose, CO 81403. —Clare L. Martin, poet and author of Eating the Heart First, Press 53, 2012. "Time out to reveal the heart"—such is the work Diane Marquart Moore has made for herself as a poet. Remembering to breathe inside the lines, remembering to delight in the gifts of the spirit, she turns In a Convent Garden and Other Poems into a new book of common prayer. Nothing escapes her heart and eye: the elder nuns, slugs, the convent cat, songs in dreams, wandering, the dog's way, Brother Rabbit, Appalachian dulcimers and the songs of katydids. —Darrell Bourque, former poet laureate of Louisiana, author of Megan's Guitar and Other Poems from Acadie. My heart leaps up when Diane Moore brings out a new book. She seems to breathe in life, then breathe out poetry—she "poems" with such ease and grace. Her poems are strikingly original and challenging; she makes the reader work hard, but the rewards are great. —Jane F. Bonin, retired professor of English, University of Louisiana, Lafayette, and author of Major Themes in Prizewinning American Drama and Mario Fratti. Diane Moore is the rare poet who has the courage to probe the exquisite wounds of human existence: loneliness, despair, suffering, want, night terrors, and betrayal. Just when the reader is at the point of pressing the button for a narcotic to dull the pain, with imagination and skillful craft, she swings through with the wry humor of a raccoon singing barroom ballads, a demonic cat dusting her allergies with dander, a sweet Sister instructing a Psalm reader to break at the asterisk or risk being swept away with the wicked, and, most healing, with joy-filled lessons learned in the course of her God-centered life. —Anne Simon, Louisiana District Judge, Retired. Diane Moore's eye is more precise than most painters, and she uses that eye to make a sacred music full of love and sympathy for what often gets ignored or forgotten. She is a wonderful contemporary amalgam of Emily Dickinson and Walt Whitman. Read her now and be delighted. —Chuck Taylor, author of Magical, Fantastical, Alphabetical Soup. Diane Moore has become a master of seeing, describing, and immersing herself in other lives. 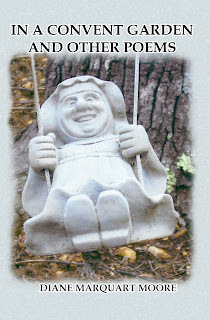 Her retired nun, Sister Mary Zita, "enters a dark cell / but her soul is not asleep;" a sculpture, "the stone angel is laughing;" and of Thomas Wolfe, she writes, "Each time I want his ghost / to give me a stone, a leaf, a door"… In A Convent Garden consists of meditations on spirituality, dreams, art, writers, travel, music, and nature. —Gary Entsminger, author of Ophelia's Ghost and Fall of '33. 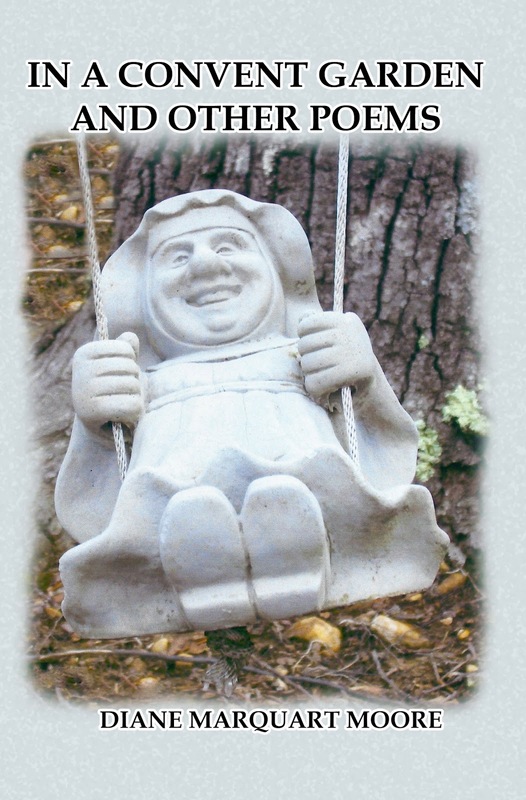 The cover photograph of In A Convent Garden and Other Poems was taken by Sr. Madeleine Mary, sister-in-charge of St. Mary’s Convent, Sewanee, Tennessee, and cover design was rendered by Martin Wayne Romero. Order copies from amazon.com after September 15, 2013.